I've never been a big fan of rules that dictate what to wear or what to drink by the season. No white after Labor Day? Please. Rosé wine only in summer? Come on. But I do have some deep-seated preferences when it comes to booze. Bourbon feels very fall to me. Bitter aperitifs like Campari and Aperol just seem very summer. Which is why this drink is so perfect for these early fall days when the thermostat still climbs into the 80s. It's like the cocktail equivalent of a summer sundress paired with a woolly sweater and boots. 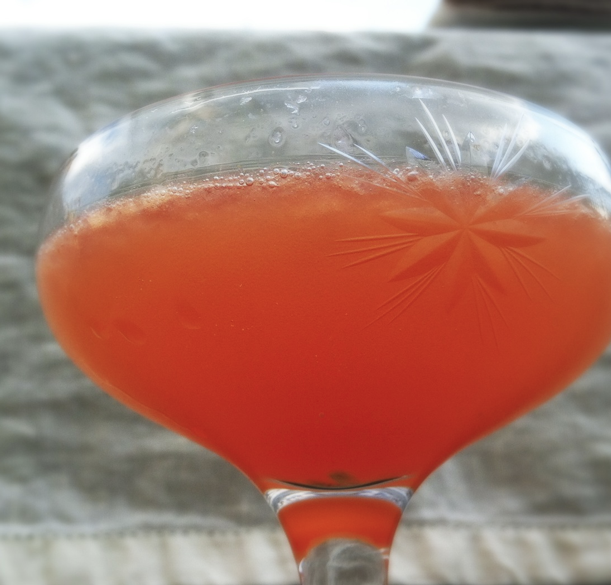 This recipe comes from my friends Mac and Chris, two of my favorite home mixologists. Mac makes a mean Sazerac and Chris served me this drink on their roofdeck earlier this summer. She got it from a friend, so it's origin is murky. All ingredients are equal parts so it's simple to commit to memory. It's also easy to batch. Just mix the ingredients in a pitcher and shake a few at a time. Combine all ingredients in a shaker with ice, shake until well chilled and strain into a cocktail glass.